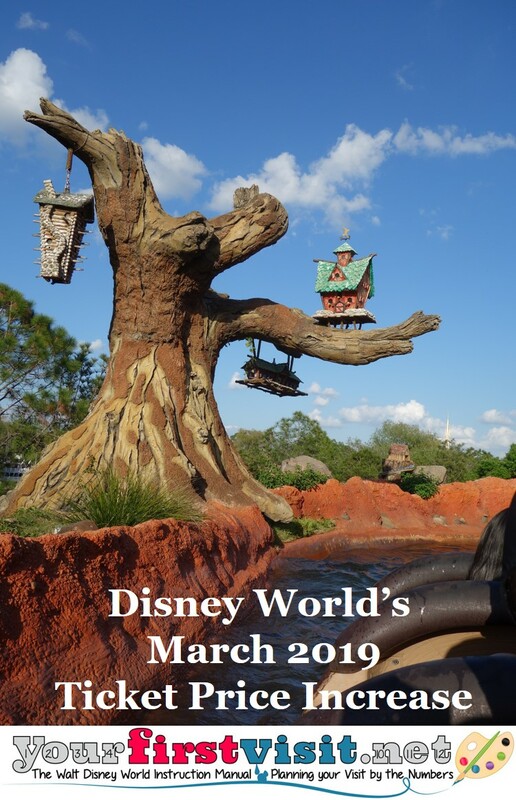 In fact, the average price increase across the ten ticket day options for adult single park per day tickets for the period April 1, 2019 through December 31, 2019 was 7.9%. 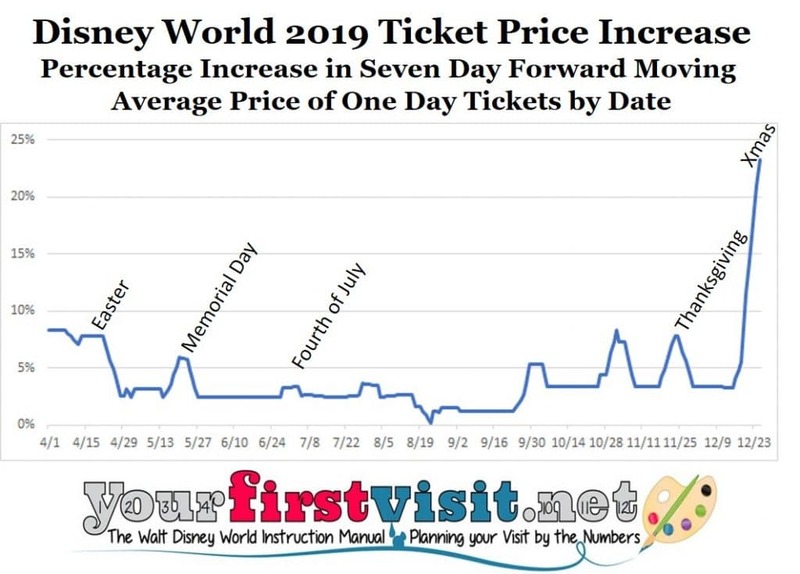 But of course no one buys an average ticket, and actual price increases vary quite a bit over the course of the 9 months remaining in 2019. 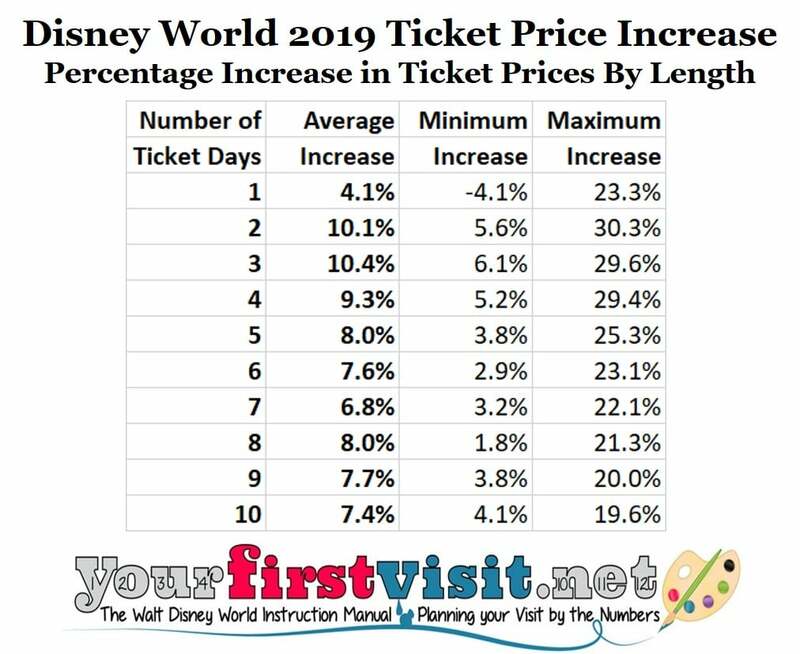 The following table shows by ticket length the average increase, minimum increase, and maximum increase for the period April 1 through December 31, 2019, compared to the prices that had already been in place for 2019. A couple of things are worth noting. First, all lengths beyond one day had an average price increase higher than the average increase in one day tickets. This mathematically means that the discount for longer tickets, on average, is not quite so high as it had been before. 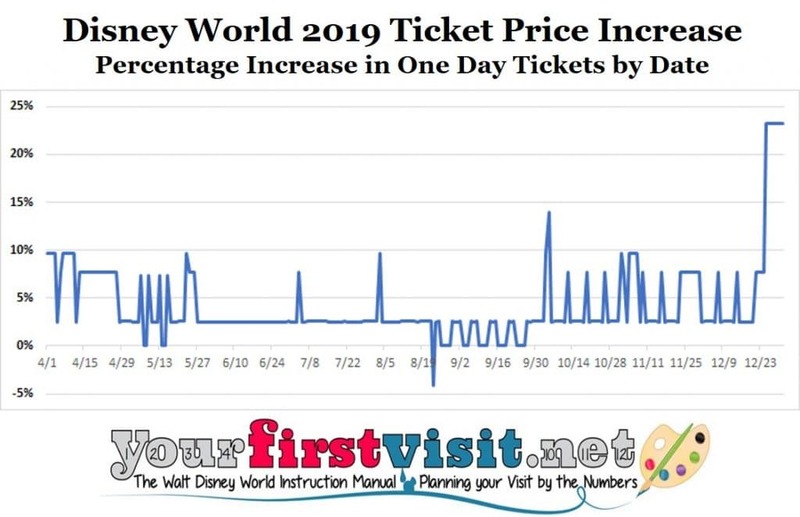 How prices were generally changed over the dates of the year begins to be clear in the next chart, which shows the percentage increase for every ticket length plotted against the first eligible day for that ticket. There’s ten colored lines (one for each length), which makes it initially messy, but the lines aren’t random—you can see the patterning within them. Here’s the same data on increases, but for just two ticket lengths whose use periods average out weekend effects, for more clarity. Ticket prices are up most sharply in many of the popular break and holiday periods. This general pattern does not surprise me, as the initially-released range of high to low prices for the date-based ticket pricing model was, at about an 18% spread between the least and most expensive tickets, too narrow to actually much incent changes in people’s behavior and drive them to lower-priced dates. Here’s the increase in one day tickets. These are important not because people buy them (hardly anyone does) but rather because the longer tickets are assembled as discounts off the sum of the one day tickets that their eligible use dates encompass. I’ve marked in this various holidays, and you can see that most—but not all—major price increases are related to holidays, beginning with Easter and spring break. There’s a couple of exceptions, at the beginning of October (but not Columbus Day week) and beginning of November—perhaps for Jersey Week?? 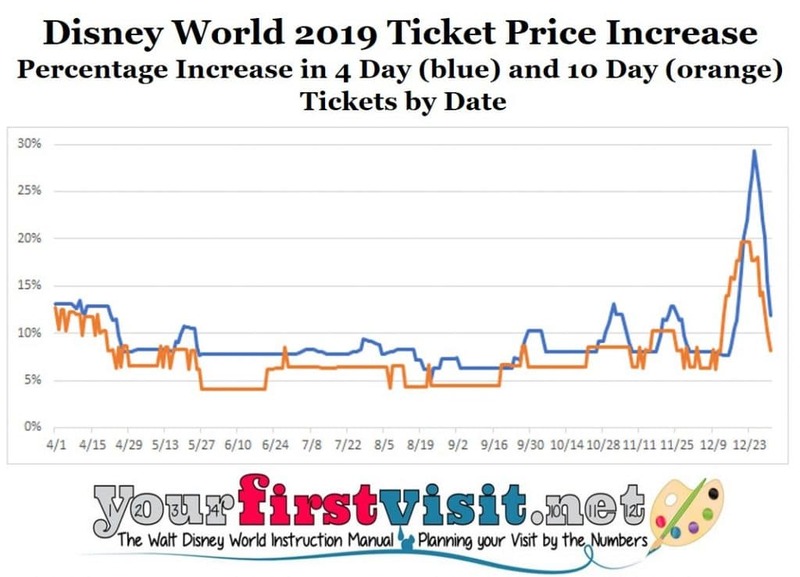 Moving on to ticket lengths that are actually relevant to many people, here’s the new spread of prices over the period April 1 through December 31 for four of the ticket lengths, comparing prices to the lowest price in the same period. 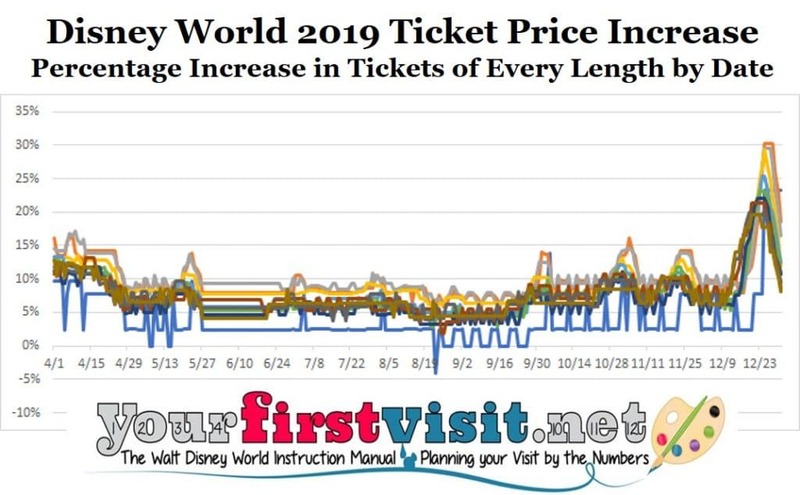 You’ll see that the most expensive tickets in the depicted lengths are now 40% higher than the lowest prices of the year. In (unshown) shorter tickets, it is 45%. At this spread, ticket prices may actually start to shift people away from higher-priced periods and into less-expensive ones. Also worth noting is that is that you see next to no increases in the period immediately after the new Star Wars land opens. 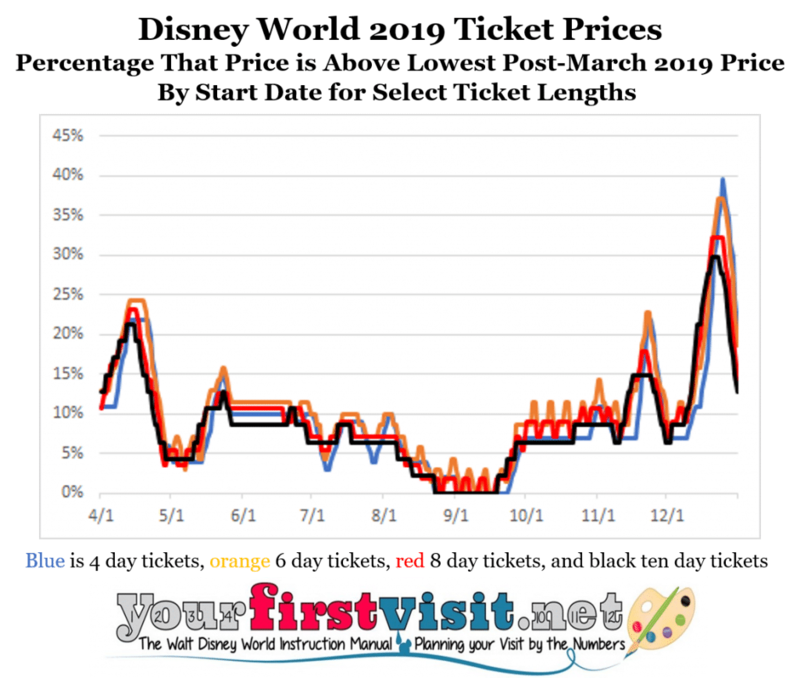 For opening day (August 29—see this) and the 30 days following, price increases average about 2%–pretty much the lowest level of price increases across the year. 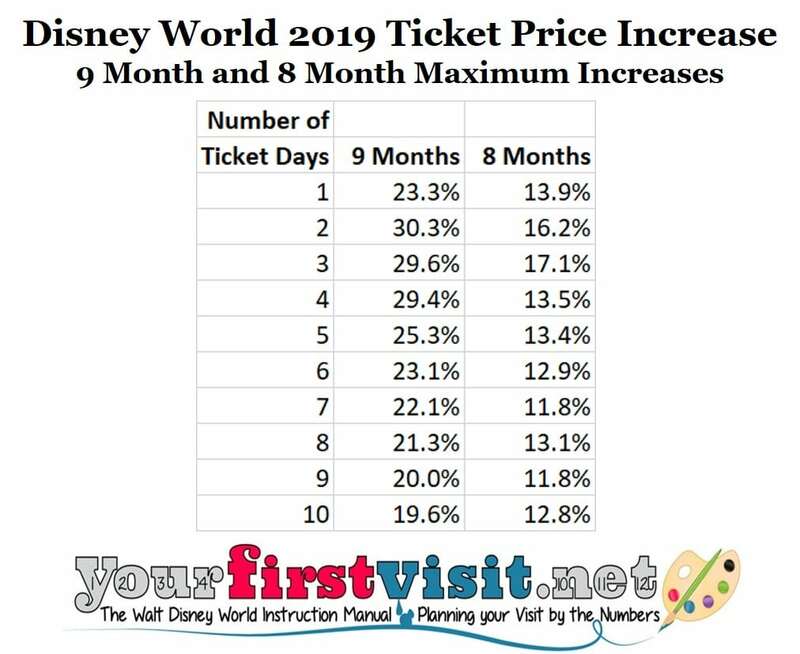 Simpler minds will conclude that this is because Disney intends to offer extra cost access options these dates, or that it expects low demand. 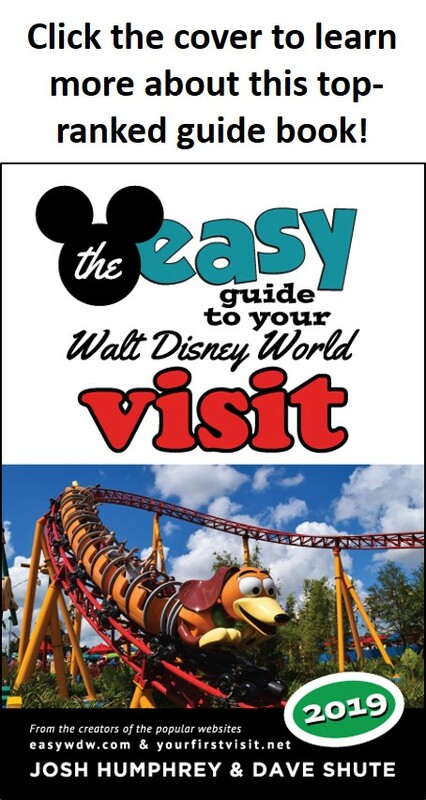 People who actually get Disney’s new date-based pricing model will understand that Disney is trying through these lower prices to incent visits to an unfinished park during an unpopular time of the year to go. The next major event on the ticket pricing front will likely be the release of 2020 ticket prices. There’s no precedent for knowing when this will happen. I’d guess at the latest it will be early summer, but it may be earlier, and frankly no one on the outside knows. Hi Pamela, I’m just a guy with a website, so I personally have no off-season. The basics on when to go are here.